Big holidays mean big meals, and the granddaddy of them all here in the U.S. is the traditional Thanksgiving dinner. Be sure to follow some simple food safety steps to ensure your turkey dinner is as safe as it is delicious. Thaw turkeys in the refrigerator, in a sink of cold water that is changed every 30 minutes, or in the microwave. Never thaw your turkey by leaving it out on the counter. Raw poultry can contaminate anything it touches with harmful bacteria. Follow the four steps to food safety – cook, clean, chill, and separate– to prevent the spread of bacteria to your food and family. If you put stuffing in the turkey, do so just before cooking. 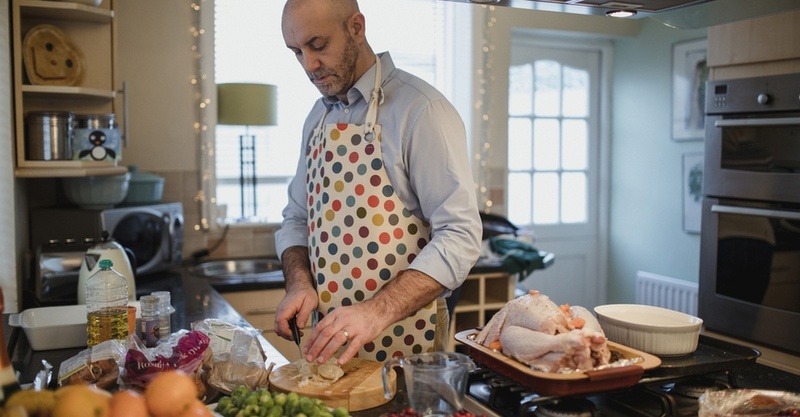 Use a food thermometer to make sure the stuffing’s center reaches 165°F. Set the oven temperature to at least 325°F. Place the completely thawed turkey with the breast side up in a roasting pan that is 2 to 2-1/2 inches deep....Check [that the internal temperature reaches 165°F] by inserting a food thermometer into the center of the stuffing and the thickest portions of the breast, thigh and wing joint. Let the turkey stand 20 minutes before removing all stuffing from the cavity and carving the meat. To explore these courses and the entire Summit workplace safety training library, click the button at the end of today’s blog post. The HSI offices and warehouse will be closed November 23 – 24, 2017 for the Thanksgiving holiday. Orders placed after Noon on Wednesday, November 22 will ship Monday, November 27, 2017. On behalf of everyone at HSI, we wish you and your family a safe and joyful holiday.